A Summary of Recent Sunfish Sightings in the Encounter Bay/Waitpinga Cliffs Area | Marine Life Society of South Australia Inc.
Sunfish sightings continued in the Waitpinga Cliffs area after the posting of my article Sunfish Sightings in the Encounter Bay/Waitpinga Cliffs Area. I thought it would be worthwhile summarising those sightings, like Dan Monceaux started doing in his article Sunfish sightings in South Australia. Dan had plans to upload those historic sighting accounts to the Atlas of Living Australia “so that they might prove useful to researchers, like those at Murdoch University who started the Sunfish Research Facebook page last year”. Big Duck Boat Tours had a sighting at Petrel Cove on 27th May 2018. Big Duck Boat Tours also sighted a smaller Sunfish off Wright Island 6th June 2018. Elizabeth Steele-Collins had single Sunfish sightings at Waitpinga Cliffs on 6th June and again on the 9th and 10th June 2018. There was a further reported sighting at Waitpinga Cliffs just West of the Flat Iron on 11th June 2018. 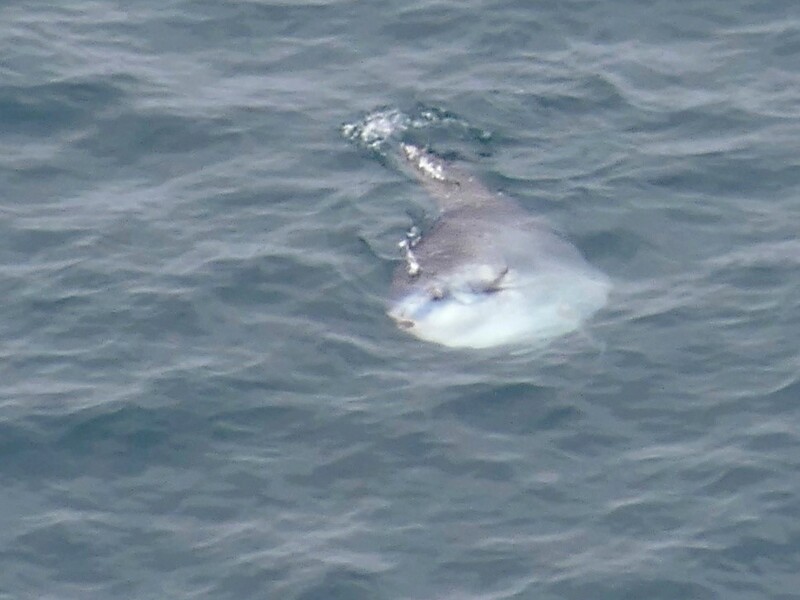 Sunfish sightings have also been reported to Elizabeth by local fisherman, Nigel Cranfield, who has had numerous sightings of one out from the Bluff Jetty since late May (estimated size as 1.2metres across the round of body). The most recent sighting of a Sunfish at the Bluff was 12th June 2018 where it was seen swimming ~15metres from the Jetty. Fishermen say large numbers of jelly fish have been seen in the Encounter Bay area since late May. Elizabeth also sent us this photo taken by Seiji Iwao of a dead Sunfish (~1.5 metres) that washed up at Parsons Beach in April 2013. Mick Sedlmayer remembers seeing one Sunfish in the Outer Harbor channel in the late 1980s (c.1987?). It was adjacent to the control tower, swimming upstream on a hot summer evening. Andrew Wright, the General Manager of Calypso Star Charters reported a sighting “5NM NNW of North Neptune Island in about 85m of water” on 2nd August 2014. 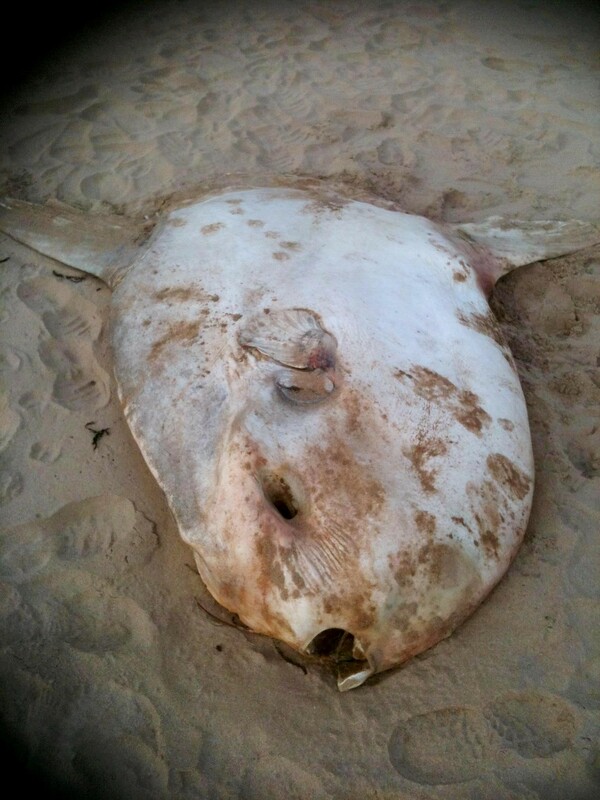 A YouTube video of an ocean sunfish in shallow water close to Port Augusta was shot by Aaron Morgan (published at https://www.youtube.com/watch?v=__mOCFppmo0 on 12 Aug 2009). The Atlas of Living Australia reveals that all four described species of Sunfish (from three genera) have been recorded in waters off South Australia. Ocean Sunfish (Mola mola) – recorded numerous times along the continental shelf south of Kangaroo Island and southwest of Eyre Peninsula. More South Australian records exist for this species than for the other three. Short Sunfish also known as the Bump-head Sunfish, Mola alexandrini (syn. ramsayi) – two specimens are in the South Australian Museum’s collection. One was collected by Mr A. White from Torrens Island on the 13th of November in 1982. The Museum’s records say that it was collected by Mr White of Rosewater via Peter Karellas of the Ozone Fish Cafe. The other was collected by John Verrier on the 27th June 1994 by a fishing boat. The animal was floating on the surface and handed onto a water fire boat. Another Mola was donated to the SA Museum in July of 1996, after being found in beach wash near Port Augusta. Sharptail Sunfish (Masturus lanceolatus) – recorded in Hog Bay, near the township of Penneshaw, Kangaroo Island. The first specimen for the state, it has since been divided into several pieces: a piece of skin, and ovary, pharyngeal teeth and a portion of tail. It was collected by C. J. M. Glover on 31st July 1965. In August of 2007, another specimen was found, beach washed at Robe in the state’s South East. Slender Sunfish (Ranzania laevis) – reported twice in South Australia. The first discovery was inferred from a cast, found at Netley. The animal was found on Aldinga Beach on 15th July 1944. The specimen was identified as Ranzania laevis in 2009 by Ralph Foster at the SA Museum. The sighting was confirmed by articles printed in several South Australian newspapers at the time, one of which depicted the animal clearly in a photographic print. The other specimen was found dead on Aldinga Beach on 23rd July 1969 by Mrs E. M. Bradley. Additional historic sighting accounts – a search of Trove indicated that the distribution of these sightings spanned much more of the South Australian coast, with locations as far apart as Streaky Bay on the west coast of Eyre Peninsula to Port MacDonnell in the south east and Goolwa at the Murray Mouth in between. Additional sightings from Upper Spencer Gulf emerged at Port Augusta and Whyalla, and a stranding event at Port Lincoln where the same animal beached on two consecutive days. There were at least four accounts from Port Augusta which were not recorded in the Atlas of Living Australia, the earliest being from 1868 (the town was only founded in 1852). Sighted by people on Heysen Trail who thought it was a large creamy white coloured Ray. By 20th June, we had discovered that it was now being suggested on iNaturalist that the sunfish being sighted by Elizabeth is actually an Ocean Sunfish Mola mola. Five photos were posted for the sunfish observation on iNaturalist. Wihtin one month, five people had agreed that the species is Mola mola, the Ocean Sunfish. Our thanks go to Elizabeth Steele-Collins for reporting the above sunfish sighting details to us. Video footage of diving with sunfish can be found at https://www.facebook.com/AquaMarineDivingBali/videos/1679745562110519/ . It presents a code of conduct for diving with sunfish and manta rays around Bali. Dan Monceaux visited The Bluff at Victor Harbor on 14th June. He swam from The Bluff to Wright Island. He found that there were lots of jimbles in the water and he took a few photos of them. It is believed that these jimbles may be what has attracted the sunfish to the area recently. “Hi Steve, I’ve been in touch with Ralph Foster recently re: sunfish, and more recently Charlie Huvaneers. Ralph suggested that the IUCN Red Listing for Mola mola is problematic, as the taxonomy is unresolved and little is known about sunfish pop’ns in the southern hemisphere. My preference now is to look into the feasibility of a sunfish tracking project, rather than lobbying for the animal’s protection. Fishermen from Port Augusta claim that they are seeing them there on an annual basis these days. That could give us an opportunity to tag a live specimen with a data logger/gps tracker, provided we can raise the money to buy one and get the necessary ethics permit(s). It could be a fantastic citizen science project, with the animal’s movements reported online over time. So I contacted Charlie, assuming he’d know people with relevant experience from tagging sharks. “The AusOcean “rig” is designed for stationary underwater monitoring applications, so would be well suited to performing a census of all of the marine animals within a given area over an extended period of time. If the rig were located in a known animal hotspot, the underwater video alone might prove sufficient, but animals would need to be within visible range of the rig. No trackers would be required though. The monitoring range could be potentially extended by using artificial lures to attract animals, assuming enough is known about sunfish to develop such a lure. Even so, the range would (be) tens of metres, not hundreds of metres or km.